The NEW Latitude SC delivers style, functionality, and security, all in one cover. The exclusive LEER patented CYNC™ latching system makes opening and closing the cover quick and easy. Open or close the cover with one hand from either side of the vehicle ... even with the tailgate closed. The Latitude SC features a rich matte black finish using field tested 21oz. vinyl sail cloth material to look great on every truck. Contoured corners feature a full material wrap secured from the inside to prevent seperation and added security fasteners keep the cover secure. 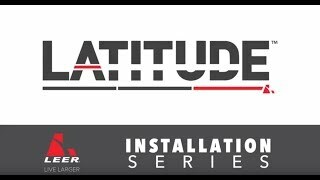 Easy installation / removal, an automatic tensioning system, and LEER's Limited Lifetime Warranty make the Latitude SC one of the best values available. CYNC’s unique, adjustable catch plate allows for mounting the system close to the tailgate for easy access. Sturdy yet flexible cross weave cover material is designed to give years of service. Self-tensioning frame system keeps the cover taught. Ergonomic forward clamps with special security snaps for easy one-person installation and removal yet worry free driving. Rear cover panel snaps securely in place, even with the tailgate closed. Sturdy contoured support framework with rounded corners and beveled edges shed water. Cover is wrapped around the frame corners and secured from the inside. Easy-adjust cover buckles and secondary security buckles hold it secure. My new truck cover was very easy to install. We just got back from a ski trip from SC to WV and all our gear stayed dry as a bone, even with rain and snow! Very happy!! This product is working great, and was easy to install with two people: moderately easy alone. I received this Leer tonneau cover as an early Christmas present. I love how easy it was to install and how it stays taut when locked down. My previous cover was a roll-up with Velcro strips and I had a hard time keeping it taut.